Near Saint Emilion, Fantastic terrace. Private pool, Big Family house. This rustic converted farmhouse is light and airy and set in an idyllic setting on the river L'isle. With spacious rooms and easy to look after furnishings, making it easy for you to relax. Ideal for a family holiday with a fully equipped kitchen and laundry. The exceptional covered terrace, which runs the full length of the house is ideal for outdoor dining and barbeques, playing table tennis or just enjoying the view. A private saltwater heated swimming pool (10x5 mt and 1.5mt deep)is situated just off the terrace, surrounded by wood decking. A wall surrounds the pool making it secure when it's not in use. There is planting down to the garden and river(unfenced), where there are two 2-man canoes available with life jackets (2 adult & 2children sizes), so you can explore the river L'isle. The house is a perfect setting for that special family celebration. We occupy an adjoining house and garden which is separated from the main house. We are here if you need us. From weekly rentals to short mid-week or weekend breaks, Only available outside of July and August. The minimum number of guest is 6 minimum or max 12. The House is only to be used with the authorized number of people. No events allowed. No extra beds available. This is a private family house. I have been in France since 1992 and we have lived at La Vieille Ferme since 1997, we spent 2 and half years renovating and now have a fantasitc house for family holidays. We Live next door with our 2 girls and 2 cats. So why not come and see us! We where looking for a project and somewhere to live but most of all we thought that the location on the river and just round the corner from all that lovely wine was a must have. Weekend and mid-week breaks availiable out of season. We had a great week at Jo's holiday home. The barn conversion is breathtaking and really well kitted out. Jo was very welcoming and the location offered the perfect base for our adventures in the Dordogne. The kayaking at the back of the property is a real added extra and proved the perfect backdrop for a wedding engagement amongst 2 of our party!! 3 families, 6 adults and 6 children aged between 8-13 stayed at this beautiful house for the last week of August. After booking and reading about the house and its facilities we were excited for our visit and we were not disappointed. This house which it tucked away up a private drive really is the ideal holiday accommodation. When you are in the house and its grounds its is so quiet (accept the children running around everywhere!) and it has a really good vibe about it. The house itself is very big and is decorated to a high standard. The bathrooms are modern and the furnishings are of good quality. You can tell that a lot of time and effort has been put in to create an ideal holiday space. There is a book in the house detailing the journey of its modernisation project from start to finish. Jo, one of the owners who lives next door could not have been more welcoming or accommodating. There is a wealth of information on offer in the house and Jo is there too to ask any questions. The facilities are tip top, the pool is a very good size and was used almost every minute that we were in, the children absolutely loved it. The river that is at the end of the garden is accessible with an Indian canoe or a two man kayak that are provided with the house. At some stage every member of our party went for paddle. The outside area is very large and perfect for an evenings eating and drinking. There is a grand dining room inside the house that we did not get to use as the weather was so good but if booking this in a slightly colder time of the year would be very regal for your evening meal. The house is situated in an area that is surrounded by chateaus, there are grapes as the eyes can see as you approach the house. The picturesque town of St Emilion is only 15 minutes away that is a must see on your trip. Overall i could not recommend this house anymore, a must for any party between 8-12. Thank you for taking the time to write such a great review. We are so glad you enjoyed the house and area. An amazing house, with so much charm! We have rented many houses over the years in quite a few countries and this was clearly one of the very best ones! We immediately felt at home and were very sad to leave. The choice was particularly important for us given that we rented it for a very special family occasion. The house is perfect, very spacious, beautifully decorated, fully functional in all respects, with a splendid terrace and great pool, plus direct access to the river with the possibility to kayak on it. Shops and supermarkets are only a few minutes away by car. Gorgeous St Emilion is 15-20 minutes and Bordeaux less than one hour. The owner and manager of the house, Joanna, is as charming as the house, very friendly and efficient, and responsive to any question or need that may arise before or during the stay. She also provides excellent advice on where to find some services in Coutras. If ever we have another family event in the area we will be sure to rent the house again. All I can say is 'Thank you' for your lovely review and that we hope to see you again in the future. A wonderful house and a great place to stay! La Vieille ferme Is a spacious house which is beautifully decorated . We were 3 couples travelling around France and we spent 3 relaxing nights here. The house caters for large groups particularly families with numerous bedrooms and well appointed bathrooms as well as everything you could possibly need to cook for large groups, as well as outstanding living areas. Sumptuous couches and a slow combustion stove made for very relaxing evenings. We particularly enjoyed sitting in the garden and in the enormous verandah where we able to enjoy the view of the garden and the river. We would have liked to have had longer to enjoy the activities on the river. The owner Jo was friendly and a wonderful help regarding places to visit and eat. The house is also close to a supermarket and vineyards. The large eat-in kitchen was fabulous ( we didn't even go into the large formal dining room)! We had a wonderful 3 days, the house is amazing and we hope to return another time with our families. It was great to meet you all and I hope your adventure continued with better weather ! I look forward to being able to welcome you again with the family in tow, just remember to book early. What a find. So glad I booked early. This house and it's garden and all it's additional features and extras from toys, canoes, kitchen utensils made our week a really memorable one. The house was much bigger than it looks in the pictures and the space was fantastic. Even though the weather wasn't that kind to us (it was rather wet and cold) the pool was still warm enough to swim in and there were enough other things to do from playing ping pong, taking the canoe out and relaxing in the hammock to keep us happy. I'd strongly recommend this place - the hosts were fabulous too. Thanks very much Jo for a great holiday. This is a lovely property with everything we needed to enjoy a relaxing holiday with three generations - from two 80+ Grandparents to two primary school aged children. It's a set up where everyone can muck in to make it fun. A huge kitchen, large living room and six bedrooms - almost all en suite. But best of all were the outside spaces - we dined alfresco every night - often with food cooked on the barbecue - with lovely local wines and cheeses. The days had relaxing cool shade for my parents, while the young kids basically became mer-children - spending hours in the pool. With the addition of a hire car, to travel to/from Coutras and for day trips out, we really had what we needed to make a great holiday. We had riding lessons at the excellent local Harris Horses, wine tours around St Emilion, a few holes of golf, and managed to fix some tennis time in Coutras - all good. We had 8/9 people sleeping there at various times - it could easily have accommodated several more. Easy to recommend - and I'm sure we will return. Really nice to hear that all went well and you all enjoyed yourself and really made use of everything around you. Coutras is situated in Nouvelle Aquitaine, at the meeting point between the Dordogne river and the Gironde. 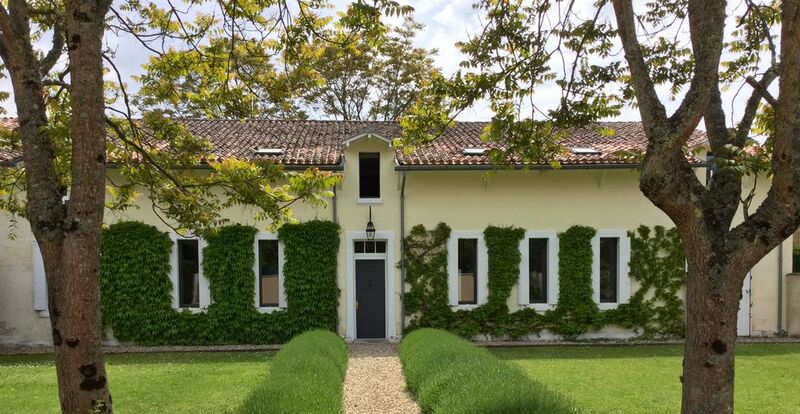 It is only 15 mins drive from Saint emilion and an hour from Bordeaux and its international airport and the ancient towns of Perigueux and Cognac. The medieval city and historic wine center of St Emilion is 20 km away, offering a wide selection of restaurants, wine tastings and châteaux tours. The wide, sandy beaches of Arcachon and Lacanau are about an hour and a half’s drive away and the thriving market town of Libourne, a must-see on a Sunday, is 15 km away. Rate based on minimum 6 guests; add an additional 40 EURO per person per night, minimum stay 3 nights. Stay tax is a legal local requirement and is paid directly to the owner.